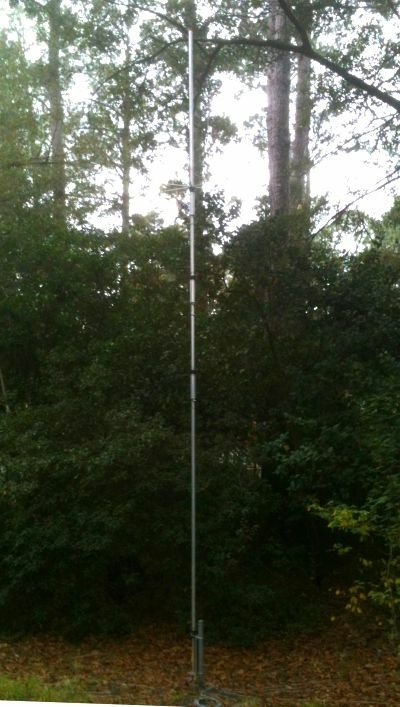 I was just wondering if a multi-band verticle antenna would work in a small backyard. I have approx. 60 foot by 50 foot back yard that has tall trees on one side, they are the neighbors, my garage and house on another side and another neighbors garage on a third side. Would a verticle with radials work in this footprint or would it be hindered by the surrounding items? It will work fine from your lot - but only with radials! Since October 2013 (with a long break for life, moving and a trip to EU in 2016) I have used a vertical for 40-10 meters and have worked 249 DXCC's with that antenna - including many of the far-flung DXpeditions. Back in 2013-2015 at my in-town QTH - I had a smaller lot than yours and managed to do very well! I've moved back to a very rural area now and reinstalled that same vertical and just recently worked 4S7 (Sri Lanka) on 40M. I'm testing different ways to add 80M coverage to that antenna and having mixed success. I am happy with my 6BTV that's in the center of my back yard. There's a line of trees on one side and chain link fencing on two other sides. I installed 33 radials which were quickly covered by the grass. It's been up for years with no problems. My advice is to go for it. First step is to adequately quantify your definition of "work". That could be anything between performing within 1dB of textbook and not falling over from it's own weight. People put up 120ft towers and they "work" and there are 6ft mobile antennas on cars, and they "work". What does "work" mean to you? From there you can apply the efficiencies of the setup you propose and pass judgement from there. Verticals tend to be better for DXing than ragchewing. They have a lower angle of radiation, while dipoles usually have more gain, though at a higher angle than you would want for DXing. Thanks for the replies and it will be something I will implement this spring. By work, I mean will a verticle allow me communications around the world, when conditions are acceptable even with the close surrounding items. Yes John, it will "work" - and communicate around the world! 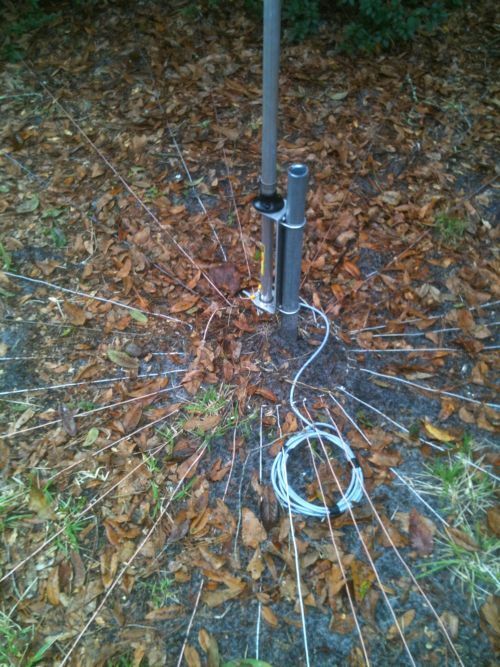 Below is a photo of my actual 4BTV at the old QTH before adding other bands or even a shut coil...used 32 radials all about twenty feet in length except in a few directions where I ran out of room. Worked the world! Still does - as it's my only antenna except for an 80M NVIS dipole only 20 feet up and a VHF/UHF discone. Here's a closeup photo of the radials - again before the shunt coil was added. After moving I re-installed this same antenna but this time I made a "permanent" install with a concrete foundation, the DX Engineering radial plate and (important for tuning) the tilt over mount. Plus, I used 32 - thirty foot radials (instead of twenty foot long radials) and along with some other minor changes - it "works" great. The real secret to a vertical like this "working" are the radials. I truly appreciate the information and the pictures. This certainly makes up my mind. as they have all said it will work. noise might be a issue so may be consider a receive antenna or put up a dipole or multi band wire to compare even temporary. i have just put a 43' vertical up a big antenna but with only a few radial only up last night its is promising. By fixing the fishing pole with reusable heavy duty Ty-Raps, you can change the antenna configuration quickly and easily. There is no advantage in buying a multi-band commercial vertical, a home made single or dual band one is far cheaper and in many cases more efficient too. Ground mounted antennas are fine on 40 and below, they are less effective on the higher bands where an elevated GP works better. Be careful of pets/children being close to your antenna. Dave, thanks for the information. I currently have an EFHW-8010-2K from MyAntenna and it works great, tunes well on 80/75, 40, 20, 17, 15 meters. It is 65 feet in the air. I do get out and have made many DX contacts. I'm just looking to try to improve the situation during the solar minimum and I thought a verticle would help some. I put up up a trap vertical for 10/15/20 meters and tuned it by adjusting the length and angle of the elevated radials instead of the traps. I've also used a 20 f t flagpole as a vertical. It sits on ABS pipe that acts as insulator. I worked well on 30 through 10 meters with an autotuner mounted at the base. It was usable on 40M but I think it was a little too lossy to be an effective DX antenna. These days I just use it as a 30M vertical, now that I have a large collection of wire antennas. Your vertical antenna page has lot's of great info...thanks! Regarding your observation that on 40 and above an elevated ground plane is better - you are probably right - but I have done extremely well on the higher bands with DX QSO's literally on the other side of the world. In fact I just checked my QSL for 3B9FR and my only contacts with him (10,208.9 miles from my QTH) were on 10 and 20 meters - both QSO's made with my ground mounted 4BTV vertical. Pretty cool when you realize that on 10M only the first section of tubing (about 8 feet?) is radiating. And, I easily have DXCC confirmed on 10M - all with the same ground mounted vertical. Elevating the vertical is probably better but a properly installed ground mounted vertical, with an adequate radial field, can still be a very good DX antenna - even on the higher bands - if elevating is not possible. I used to have a Cushcraft R7 (pre-MFJ) on a 15' pole just above my roof, I worked the world with that antenna.